Sinazo “Qaqamba” Didiza was born to a teenage mother in September 1989 in Mthatha, a town in the Eastern Cape Province of South Africa. Like many teenagers who give birth out of wedlock Sinazo’s mother was unable to raise a child and finish her studies. Nonetheless, she strongly encouraged Sinazo to get an education. Funds were limited growing up and Sinazo was fortunate to be able to complete high school at St. John’s College in Mthatha in 2007. Although no woman in her family had ever obtained a university degree, Sinazo was determined to do so. In 2008, she enrolled to take classes part time at the University of South Africa (UNISA) in Mthatha, while working as an administrative clerk. 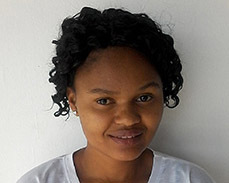 While still struggling to obtain sufficient funds to complete all of her coursework at UNISA, Ms. Didiza became a volunteer peer educator at LoveLife where she taught young people about HIV and teenage pregnancy prevention. In 2010, Ms. Didiza was able to obtain financial support from the Department of Social Development to attend the University of Fort Hare in the Eastern Cape. In May 2013, her dream of becoming a university graduate came true when earned her Bachelor’s Degree in Social Work. While attending the University of Fort Hare, Ms. Didiza co-founded the Ulutsha Society Development Foundation (USDF), an organization which provides career guidance and information on sources of aid for students from financially-disenfranchised backgrounds. USDF’s vision is to empower youths to break the cycle of poverty through offering them educational opportunities. Ms. Didiza also became a member of the Indlovukazi Women Empowerment Society, a student organization at the University of Fort Hare that focuses on women’s personal development, human rights, and safety in school residences. In 2013, Ms. Didiza joined the Masimanyane Women’s Support Center, a non-profit organization that seeks to end violence against women and promote women’s rights. Currently, Ms. Didiza is the Youth Center Program Coordinator at LoveLife, studying for her Master’s Degree in Social Work at the University of Fort Hare, and she recently completed a six-week Mandela Washington Fellowship in Civic Leadership at Arizona State University in the USA. The Mandela Washington Fellows program is highly selective (it has averaged a 1.25 percent acceptance rate since its inception in 2014). The program is part of President Obama’s Young African Leaders Initiative (YALI) which provides networking and entrepreneurial training for promising young leaders. Among the class of 500 Mandela Washington Fellows for 2015, only 100 were selected to participate in a six-week Professional Development Experience following the initial six-week program. Ms. Didiza is one of those 100. She is being hosted by the Philadelphia-based organization Women’s Campaign International. On August 18th, as part of her Professional Development Experience, Ms. Didiza met with Dr. Lin Fan Wang of the Mazzoni Center to share her thoughts on best practices for establishing a women’s health center, one of the things that she would like to do upon her return to South Africa. Ms. Didiza will leave the USA on September 18th. When she is back in South Africa she intends to continue her work with young people and to seek opportunities that will expand the inclusion of sexual reproductive health rights education in schools. She also intends to empower young women to take charge of decisions concerning their sexual and reproductive health through her initiative called the Sexual Health Rights and Advocacy Foundation and to graduate with her Master’s Degree in 2016.